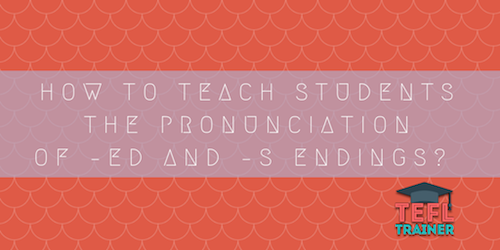 How to teach students the pronunciation of –ed and –s endings? Learning a language is difficult and I basing that of my first-hand experience. Attempting to pronounce words that sounds completely different in your mother tongue can take a few tries. So EFL students often mispronounce words or a part of that word and it is our job as teachers to correct them and explain the reason behind this correction. This diary will focus on how to teach the –ed and –s endings of words. On my very first day as a teacher I was listening to a student read through a text. I corrected them when they mispronounced the word ‘stopped’. The student then asked how to know when to pronounce the –ed endings in different ways. I remembered from the TEFL online material that there were three different ways that we pronounce –ed endings in English; -t, -d and –Id. However, I wasn’t sure how to spot the difference and tell when each ending in used. Luckily, for me the poster that we have in every classroom had the endings and the words that match each of the endings. As well as showing the endings by using the phonetic alphabet. I didn’t understand at this early stage how the phonetic alphabet worked so I decided it would be important to do some research. Since then I have used the TEFL online material coupled with videos on YouTube to be able to learn and refresh my memory on the phonetic alphabet. It has helped me to become confident when I am giving an explanation to a student or answering a question. And therefore, I’m now more than happy to explain the difference between voiced and unvoiced sounds and which IBA letters they are. Throughout the course I have explained the reasons for the differences in pronunciations of -ed and –s endings, but when explaining to students I have noticed the different ways in which students learn which I find interesting. Most teenagers or young adults tend to just want to learn the how different words have the different sounding endings. Whereas adults that I have taught seem very keen to write down the phonetic alphabet when trying to learn the different pronunciations. This fact has made me glad that I took the time to study the phonetic alphabet and have, even if only a basic, understanding of the differences in pronunciation. My lessons have really made it clear that everyone learns differently and this has helped me to develop my ability as a teacher in order to spot this and then adapt my lessons accordingly.